It’s 4 AM and as usual, I’m on one of my late night stints on the great web either reading stories (check out the end of the intro for suggested mats), looking for exciting project ideas, or contributing to the bizarre and already contaminated parts of the internet. Save for the times when I need to run down to the kitchen to refill my bowl with cereal, my face, quite literally, has been fixed on a screen for weeks, my cameras, laptop and mobile devices may as well be new limbs. Those, and my cereal spoon. Even my dog, Arthur, has gotten used to this pitiful new routine from which he is now quite happily passed out and snoozing away beside me. But yes, folks, I know. There are far better and more inspired things to do than to take sleep for granted. Like sleep, for example. However, tonight, I fear there’s nothing that can tear me away from my computer screen. For tonight, I fulfill myself with a Britney Spears marathon, and tonight, I bring you a new recipe. It has been ages since I last published a food story for the Meek website but believe me, in between this and my Beet Pasta are several failed culinary attempts. (Perhaps one day, I might even show you my disastrous fudgesicles experiment!) Today, I present to you these delectable nuggets of awesomeness where your chocolate fantasies meet a healthy plan of attack. And no, love, I kid you not; such wondrous things are possible on this earth, and are made even better with a touch of superfood rockstars, Açaí and Chia. Because amidst a gruelling college/interning/sidelining life, a girl has got to stay fresh and energised and still be able to play MTV marathons on YouTube during the wee hours when 4 hours of her day went to city traffic. That's energy no regular sugary chocolate bar can provide you with. 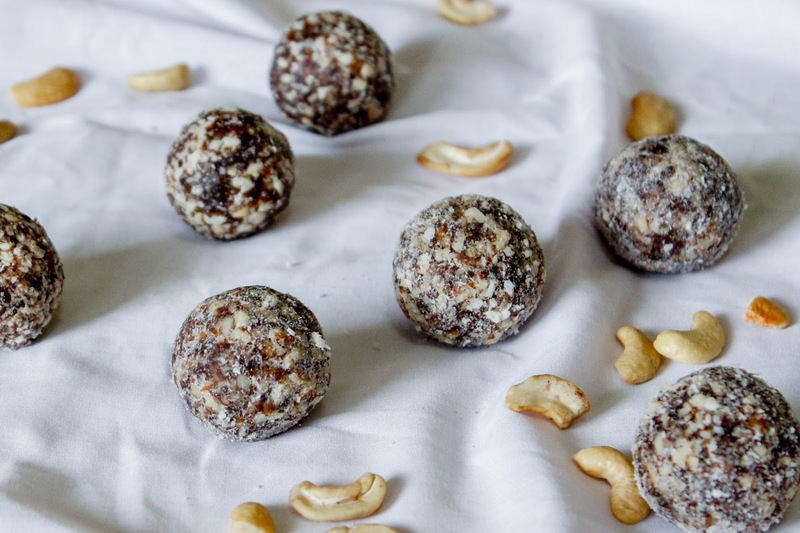 My friends in class loved these energy bites the other day, passing along these açaí-flavoured ones as well as the cinnamon-almond variety with bare hands, so I do hope you enjoy this recipe and soon find yourself making them, too. I can't be certain if it's the energy balls talking, but I'm bursting with inspiration right now and I’m thrilled to show you the materials I’ve been working on, or at least envision myself revelling in the future. For now, though, I leave you with this; an epic I'm a Slave 4 U experience awaits me in another tab. 1. Crush the cashews in a food processor for a minute or two, or until a flour-like texture begins to form. 2. Add cacao, coconut oil, desiccated coconut, chia seeds and açaí powder to the mixture and then slowly process before adding in the dates. Continue blending until everything turns into a sticky smooth dough. 3. Roll tablespoon-size balls out of the mixture using your palms. 4. From this point, you can do whatever you wish to do with these now energy bites. Roll in coconut and/or crushed cashews, leave in the fridge to firm, or, be like me and consume the mixture straight from the blender.